New Orleans restaurant owner Ralph Brennan had only recently started to see business pick up following Hurricane Katrina and the recession when he was hit with another blow: the Gulf oil disaster. Since the Deepwater Horizon oil rig exploded and began spewing oil off the coast of Louisiana, Brennan says the price he pays for shrimp has gone up around 25 percent, and oyster prices have almost doubled. Still Brennan has continued buying locally obtained fish and even increased the seafood offerings on the menus of his eateries Bacco, Red Fish Grill and Ralph’s on the Park. “The only way the restaurant owners can help the fisherman is to increase demand,” Brennan said. For now, he is mostly absorbing the increased seafood costs rather than risk raising menu prices. The price of seafood from the Gulf of Mexico has skyrocketed since the underwater gusher began spewing April 20, raising worries about the area's present and future as a seafood hub. On Wednesday, the National Oceanic and Atmospheric Administration expanded the amount of federal waters in the Gulf of Mexico that are closed to fishing because of the oil disaster to 80,806 square miles — or about 33 percent. The rising prices are having a significant impact on restaurants along the Gulf Coast, which tie their menus closely to the unique tastes of the local seafood. But it appears to be having much less of an immediate effect on major restaurant chains nationally, which rely more on a global supply chain and negotiate longer-term pricing contracts. In addition to pricing, Gulf restaurant owners also may increasingly find themselves battling fears that the area's seafood has been tainted by the oil. In a visit to the area earlier this week, President Barack Obama took pains to assure the public that they should feel comfortable eating locally caught seafood. "So let me be clear: Seafood from the Gulf today is safe to eat, but we need to make sure that it stays that way," he said. Only about 2 percent of the seafood consumed in the United States comes from the Gulf of Mexico, said Jim Kenny, market reporter for Urner Barry Publications, which provides wholesale food industry price quotes. Gulf seafood tends to be eaten locally or at upscale restaurants elsewhere in the country, he said. Restaurants in the region have a strong bias for locally sourced product and are unlikely to look overseas if they can’t get their shrimp, oysters or other seafood from the Gulf, said Wendy Waren, spokeswoman for the Louisiana Restaurant Association. 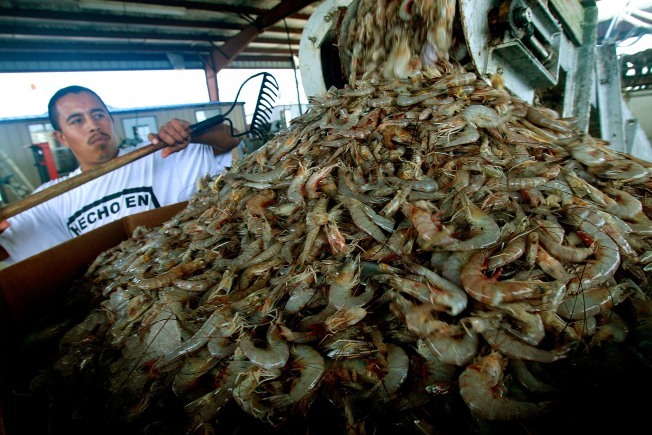 Since the oil disaster began in mid-April, Kenny said the price of various types of shrimp coming from the Gulf have risen between 18 percent and 51 percent on average, with the size of shrimp that represents the bulk of the market skyrocketing by 44 percent. Kenny said that compares to a 14 percent increase in the price of imported white shrimp, which makes up the vast majority of the shrimp eaten in the United States. The imported market has been hit by a disease outbreak in Indonesia, the second-largest U.S. supplier. For major restaurant chains supplying stores across the country, it’s not just that seafood from the world over is cheaper — there also simply isn’t enough domestic seafood to feed all their customers. About 23 percent of all seafood imported to the United States in 2009 came from China, according to Urner Barry. Other major importers include Thailand and Canada. Darden Restaurants, the Florida-based restaurant chain whose brands include Red Lobster and Olive Garden, only gets a small portion of its seafood from the Gulf area, spokesman Rich Jeffers said. The chain buys the bulk of its seafood on the world markets and also tends to have longer term pricing contracts, Jeffers said. That’s why he doesn’t expect Darden to see any major, immediate impact from the Gulf oil disaster. “Clearly the folks that are most impacted by this are the independent operators along the Gulf coast,” he said. Waren, of the Louisiana Restaurant Association, said some Louisiana restaurants are looking at bringing back old or rarely used recipes or using substitute products like alligator or catfish instead of shrimp and oysters. Some are making other menu changes as well. For example, the oysters typically served raw by New Orleans restaurants have lost their usual briney taste because of a surge of fresh water meant to keep the oil at bay, Waren said. So some restaurants are charbroiling them or just serving them in stews or gumbos instead. Brennan, the New Orleans restaurant owner, said that for now he is able to get as much local seafood as he wants, albeit at a higher price. His main worry is how the supplies will be affected in years to come.